Oh. My. Gosh. I heard about these “Mr. Potato Head”-type of pumpkin decorations on another blog and we got some. They are PERFECT. 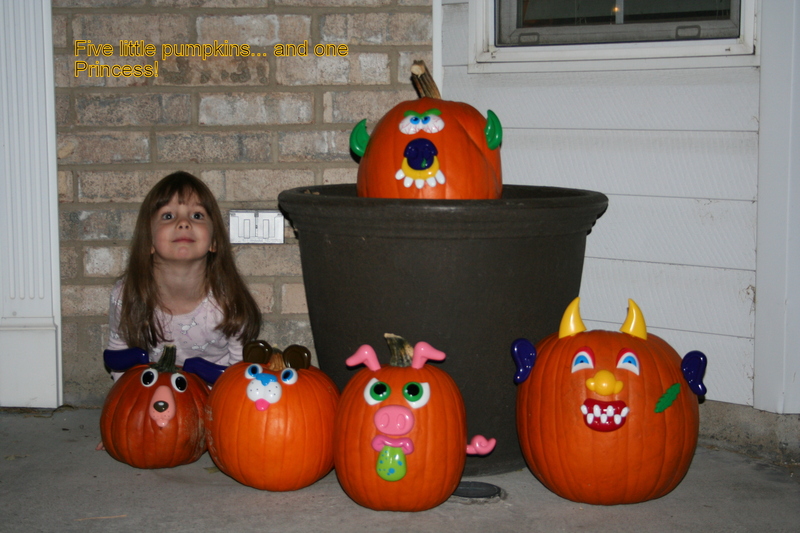 They made fun and cute pumpkins and it only took about as long as Princess’ attention span. And DMP and I were suprised at how cute they turned out. Super-cheap, too. They were only 3.50 at WalMart (we got two packs- animals and monsters). Love it! October 28, 2008. Tags: Halloween, pumpkins, things I love.. Uncategorized. Thanks for sharing! I get on and read Cyndi’s mutterings sometimes, too, and click over to Becca’s. I’m following you girls a little now that I’ve had a taste of “family” again. You are all really great writers, btw. Hello to everybody! October 28, 2008 at 10:09 pm. Permalink. Thanks for the address for your blog. It is such fun to keep up a ittle more. The pumpkins are great!!!! Happy Halloween. October 28, 2008 at 10:34 pm. Permalink. That is the way to do it. I like the pig! We don’t dare carve our pumpkins until a few days before because otherwise they melt! October 28, 2008 at 10:50 pm. Permalink.